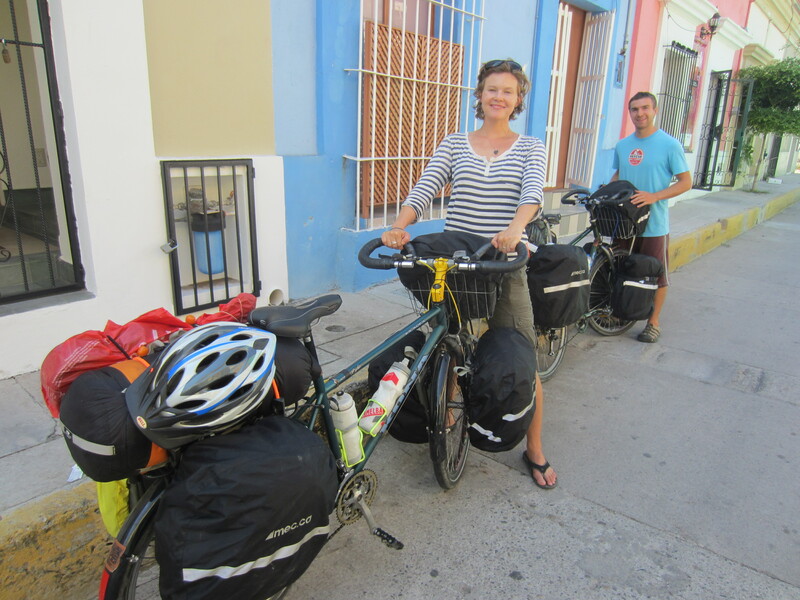 Cross-Continental Bicyclists Sarah and Jacques Visit Mazatlán | ¡VidaMaz! We met Sarah and Jacques on Day of the Dead. They were just packing up their bikes, as you can see. They had left Sarah’s home of Vancouver Island, Canada in July, bicycling south along the coast for four months. Then they hit Mazatlán. Thus we met two additional interesting people who love this port of ours. They are planning to pedal their way south to Argentina. I asked how long of a trip they are planning, but it sounds pretty open-ended. They have their whole lives ahead of them, they told me. “Oh, yeah, it was awesome,” they told me. “It is cool, too, how it’s the extranjeros keeping the Mexican culture alive—artwork, dressing up…” Fascinating to hear a passer-through perspective. If you’d like to follow their journey, their blog is at www.peacewheel.wordpress.com. We very much wish them many wonderful adventures, much joy, insight, health and safety, on their journey!